me me me... I want one. Holy crap. Go check out this super cute athletic jewelry by Sporty Girl. 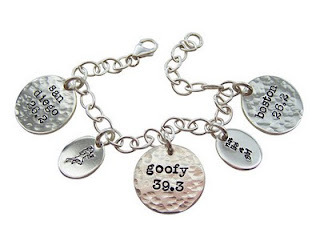 Stacey over at Runner Girl is having a giveaway I want the race bracelet. I am not sure which marathons I would put on the tags.... I think 13 tags would be a bit much. Maybe Boston '08, STG '07 and RUN FAR.... huh??? I will have to think about it. I know, it is ALL SOO CUTE! Glad you're back ;) I do love those necklaces!